The 1955 Stirling Moss Scrapbook has once again been made available to an eager public, to commemorate the sixtieth anniversary of this crucial year for the racing driver. 20.08.2015 - Arguably the world’s greatest all-round competitor, Stirling Moss was a hero to several generations of schoolboys and enthusiasts throughout the world. Moss is now so iconic his name is often used as a metaphor for ‘racing driver’ – the sound of it alone invoking mental images of speed, bravado, a jet-set lifestyle and a bevy of beauties with whom to live it. By 1961 his career was at its peak; absolutely at the top of his game, a charismatic sportsman famous across the world. But 1955 was the first really crucial year for Moss. This was when he averaged almost 160 km/ph to win the Mille Miglia. It was the year of his first Grand Prix conquest, stealing victory in the British GP by only centimetres from World Champion Fangio. Triumph in the gruelling Targa Florio clinched the World Sports Car Championship for Mercedes-Benz, too. Young Moss was a man of extraordinary energy, a dedicated sportsman and a notable personality. Throughout his career he created personal scrapbooks, several volumes per annum, and kept a diary and photo albums too. 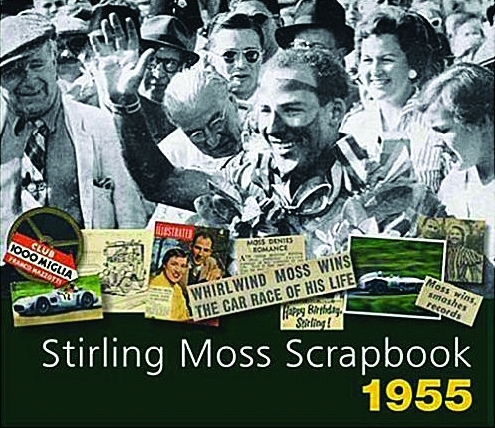 The first of a series of Stirling Moss scrapbooks, which now includes as separate volumes 1926-54, 1956-60, and 1961, the 1955 book evokes memories of the heyday of classic motorsport. It is packed with intriguing detail, superb illustrations, an abundance of personal comments, and period cuttings from around the world. Moss has a fund of stories and is refreshingly non-PC at times! The book paints a vivid picture of the fun and flavour of fifties motor racing, spiced with Stirling’s anecdotes as told to award-winning author Philip Porter. To celebrate the sixtieth anniversary of the events depicted in the Scrapbook, it has been reprinted once again and is now available to order. Described as “immediately collectable” and “a fascinating insight second only to delving into the albums with Moss himself”, this book is a must-read for any historic racing fans. For more information see: www.porterpress.co.uk. Produced with news.CMS in 0,0647 seconds.